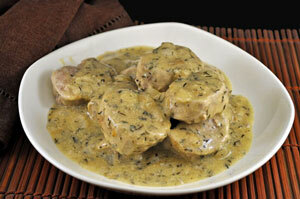 Pork Tenderloin, White Wine Mustard Sauce, Thyme for Cooking gourmet recipes. Pork tenderloin is great for mid-week meals: it cooks quickly when sliced, yet stays tender and moist. 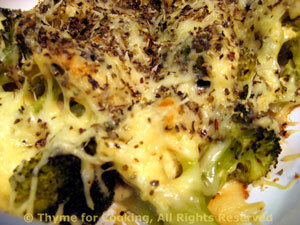 The broccoli is steamed first, then baked just long enough to brown the top. 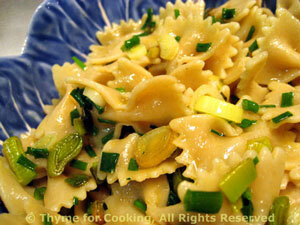 Simple pasta, tossed with a fruity olive oil and Green Garlic.... And a few chives. Spring! Trim green garlic, slicing off the root and removing 1 layer. Thinly slice as much as you can, including the green tops. Or trim and slice leek, mince green garlic. When pasta is done, heat the oil in the emptied pasta pot. Add green garlic / leek, garlic and chives. Sauté 1 - 2 minutes. Add the pasta and stir well to combine. Serve.